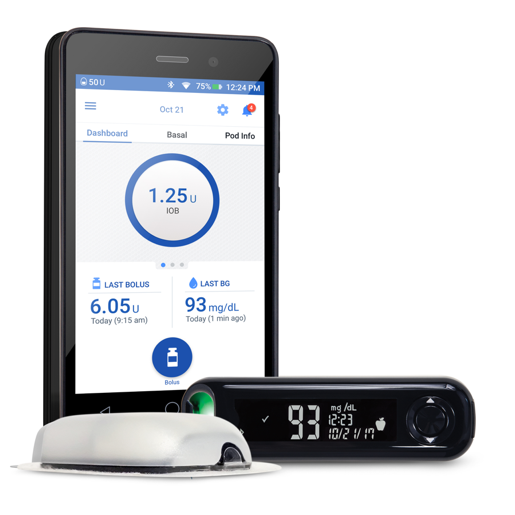 Insulet announced that the FDA has cleared its Omnipod Dash system, which consists of a new and improved touchscreen handheld (PDM) and a Bluetooth-enabled tubeless pod. (Omnipod is a tubeless, or “patched,” insulin pump worn on the body; read about how it compares to other pumps here.) Insulet also plans to launch its Omnipod Dash user/caregiver display apps for Apple devices later this year. The new Dash PDM updates the current handheld, whose design has not changed in five years. Dash is a “locked down” Android smartphone, meaning it adds Bluetooth and the touchscreen experience of a consumer-grade device, but without the cellular capabilities or other apps. 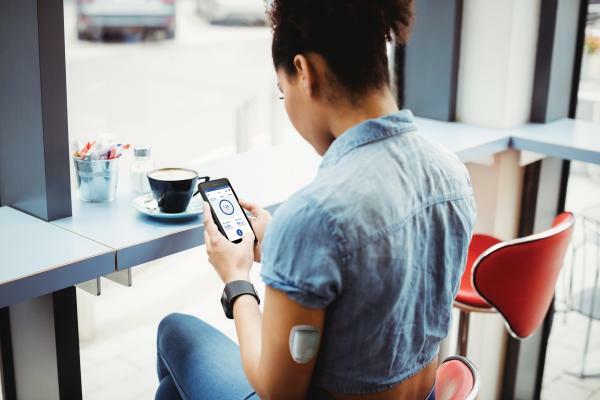 Dash will communicate wirelessly with the pod to deliver insulin and will receive data from a separate Bluetooth-enabled Ascensia Contour glucose meter. For parents, Dash will add remote monitoring capabilities – the new PDM handheld will relay insulin pump data to a nearby smartphone (e.g., insulin on board), enabling caregivers to then remotely “follow” a user’s data (similar to following CGM data). Aside from integrating Bluetooth, the tubeless pods remain the same, holding 200 units of insulin and lasting three days. The pods can only talk to the PDM, meaning viewing data on your own smartphone will require the PDM to be nearby. In other words, the Dash PDM “relays” the data to a Display app, but it won’t reduce the number of devices you have to carry. We think of Dash as an interim step on the way to the ultimate goal: allowing users to control the pod directly from their own phone. Insulet has not given specific timing on when that might be available, but we’d guess it’s in the pipeline. Since Dash is a locked-down Android phone, it also removes the integrated Abbott FreeStyle glucose meter. Each system will now come with Ascensia’s Contour Next One, which will send results wirelessly to the Dash handheld and right into the bolus calculator. Other Bluetooth-enabled meters will not send data to Dash at launch. For current Insulet users, not having the integrated Abbott glucose meter will be a negative change. The advantage of subtracting the meter is it makes the Dash PDM much slimmer, allows Insulet to use a consumer grade phone, and aligns with the trend toward more use of CGM. Beginning in the second half of this year, Insulet will commence the “Dash Ahead” program, allowing some endocrinologists to prescribe the system during a six-month US limited market release. A full US launch is expected in early 2019. (Dash is not cleared for use in Canada or Europe, where customers will continue to use the current Omnipod system.) Omnipod customers will get one free Dash PDM every four years with the purchase of pods – we’re glad to see no expensive upgrade fee! Dash will not be backwards compatible with the current pods, since the new PDM changes the communication to Bluetooth. For now, Dexcom CGM data will not be sent to the Dash PDM; this will have to wait for Insulet’s Horizon hybrid closed loop, which remains in studies and is slated to launch in about two years. Users can see their Dexcom and Omnipod data side-by-side on their own phone through a lock screen widget (see below). As noted above, this will require the Dash PDM to be nearby. The addition of Bluetooth and Wi-Fi to the system allows for: (i) passive data upload to Glooko (at full launch in early 2019); (ii) smartphone connectivity (see below); and (iii) remote software updates (the second pump to be designed around this feature, after Tandem’s t:slim X2). The Omnipod Display app allows users to discreetly monitor their pump data on their own smartphone, along with a cool feature called “Find my PDM,” which presumably allows a user to locate the PDM nearby via Bluetooth. An Apple iPhone Today widget on the lock screen will enable users to see their pump data side-by-side with their Dexcom data. The Dash PDM itself will not display Dexcom G5/G6 values at launch. 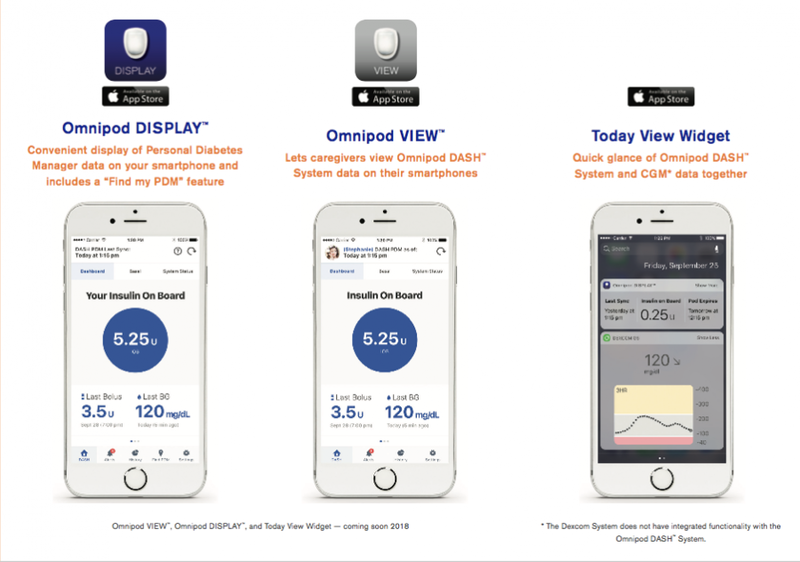 The Omnipod View app allows up to 12 followers to monitor their loved ones’ insulin pump information (this is completely optional).